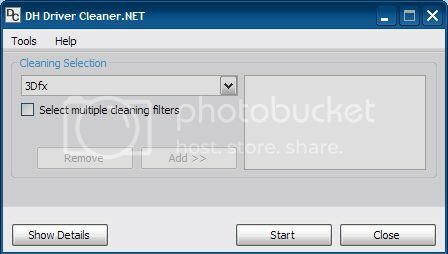 Discussion in 'Driver Cleaner.NET Support' started by Tipstaff, Jan 4, 2007. 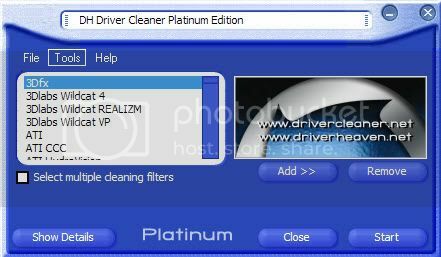 Driver Cleaner is just that: a cleaning program for a specific list of device drivers, and it's related registry locations. It does not clean spyware, adware, trojans, malware, viruses, or scan/fix hard drive issues. To put it as politely as I can: if the program you ran doesn't look like this, or does but doesn't have listings for cleaning out video/audio drivers (such as 3dfx, nVidia, ATI, and Creative), then you should be taking your issues, and complaints up with someone else (such as your Internet provider, or the place in which you got the software) as what you are running is NOT the real deal folks. Edit: Update due to lost link for PE version pic, and included pic of .NET. Tipstaff thank you for this. I made it a sticky and hope this helps. I noticed that the pic disappeared, so I figured I'd update the first post to include a pic of both the original Driver Cleaner PE, and the new Driver Cleaner.NET.